Throw a stick anywhere in Westminster and it'll hit a pho joint. Not so in Irvine, where Vietnamese restaurants are as rare as the slices of steak in the soup they serve. At my last count, there are exactly five eateries that serve this foul-weather food. The stalwarts are the two Pho Bac Ky's and the Pho 99 on Jeffrey. But the rest changes hands more often than a basketball. The latest to get passed is Saigon Grille, which enters the open court as Pho Ha Noi, managed by the same people who brought you Pho Hung Vuong in Tustin. But for a few months after the purchase, no one bothered to take down the Saigon Grille sign, leaving many Irvinites who received coupons in the mail for Pho Ha Noi wandering the streets baffled and soupless. They did finally send somebody to Michaels to buy white stencil to put up the new name on the windows. This stemmed the confusion at least for this diner, but others who walk in never having been to Saigon Grille wouldn't have known the difference anyway -- they kept the opulent interior exactly the same. Red walls. Slanted mirrors. Wicker-backed chairs. It's a pretty space that works. What's changed is the menu. Previously, Saigon Grille featured big ticket items like the $16 mien xao cua (stir fried vermicelli noodles with crab meat) and baked catfish. It was optimistically ambitious cuisine for a neighborhood that just wanted pho. 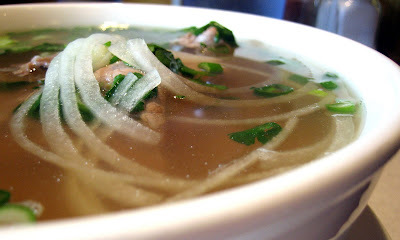 Wisely, Pho Ha Noi got the message: No one wants to pay more than $10 on Vietnamese food, even in Irvine. Now just the basics are offered at prices slightly higher than Little Saigon rates, but dramatically lower than its predecessor. And they're still adjusting them to appease the stingy nature of pho-eaters -- the lunch specials were marked down by a buck in the last month. $6.95 now gets you a bowl of pho, a crispy egg roll made from rice-paper, and a soft drink. As for their titular noodle soup, it's sweeter and richer but otherwise identical and indistinguishable from those served on Bolsa St. However, for those who suffer from pho fatigue (or as I like to call it, pho-tigue), there's the hu tieu mi dac biet which retails at about $7. In a bowl and over two types of noodle (crinkly egg and jelly-clear glass), a hot pork/chicken broth is poured. 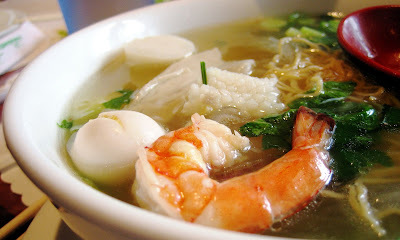 Then on comes toppings of steamed shrimp, fish balls, slices of pork, curly cuts of squid and two boiled quail eggs. Some float, some sink; all are welcome, especially the quail eggs. If you're reading this after February 18th, 2008, you might as well stop: Asameshi Maeda Honten will have already packed up and left for San Diego, its next tour destination. Sort of like a band that belts out noodle soups instead of tunes, you can find this Japanese ramen shop here, at the Costa Mesa Mitsuwa until Monday the 18th, as part of the supermarket's "Legendary Ramen Fair". Well, that last part is a misnomer. It's not a "fair" as much as it is a rotation of three popular ramen chains out of Japan exhibiting their wares. And as far as the Costa Mesa Mitsuwa is concerned, only Asameshi Maeda Honten is involved, and only until Monday. But if you happen to run across this post before Monday, here's a bit of info. First, if you don't read Japanese script, finding Asameshi Maeda Honten might be difficult. To the casual observer, it will look like any other stall, especially since it has temporarily taken over Sanuki, the shop that normally serves udon noodles at the corner of the food court. I only found it by playing a game of one-of-these-things-is-not-like-the-others. 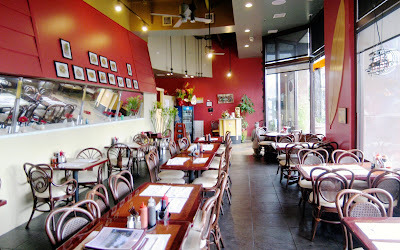 Once you do locate it, you'll know because the shop will serve only one dish: their signature shoyu ramen for $6.99. You walk up, you pay, you get a scrap of paper with a number, and you wait as the kitchen pushes out the hot bowls faster than Lucy Ricardo can eat chocolates. The soup is a glorious brew culled from long-simmered pork bones and soy sauce; a rich and salty staple of Hokkaido, where Asameshi Maeda Honten hails. But the most glaring feature you'll immediately notice is the thick layer of liquified fat. In addition to flavor, ramen aficionados purport that the fat has a practical purpose: it insulates the broth so that the soup maintains its temperature until the last drop is sipped. It coats every strand of the chewy noodle I lift out of the bowl and slicks my lips to an oily shine. And if that weren't enough, there are wispy shavings of roasted pork meat which also seems to slowly melt its lipid reserves into the liquid. There's no escaping the pork liquor. 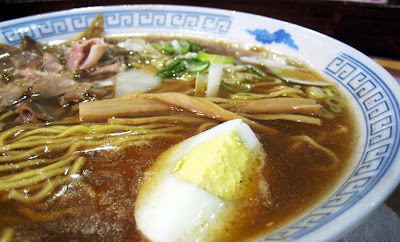 The porcine power of the soup almost makes you forget all the other good and worthy attributes of the bowl: the snappy strips of bamboo shoots, the herby scallions, the perfectly-boiled quarter slice of egg, and of course, those slurpy egg noodles. If this all feels like test marketing, it may very well be. The bowls play like a singles track meant to hook customers into buying the rest of the album. But really, Costa Mesans and other OC-dwellers shouldn't fret. 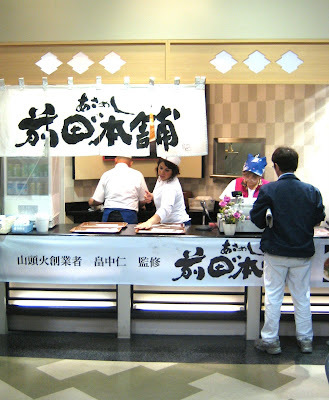 In the same food court stands Santoka, the ramen joint that many consider the best on our coast. And they're playing full sets of their noodle soup hits and staying for a permanent run. Irvine's got its share of office park food courts. If you are a fellow cubicle drone like me, you've been to one. 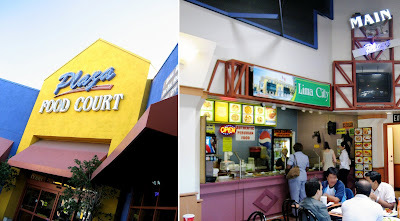 And if you're apt to avoid the usual standbys of the Panda Express clones, you also know which of these food courts actually have something special. No doubt, by now, you've heard of Franco's Pasta Cucina for those obsession-worthy, made-to-order creations of noodles, sauce and meat, sold cheaply by a man so irascible that in hushed circles he's lovingly referred to as "The Pasta Nazi". 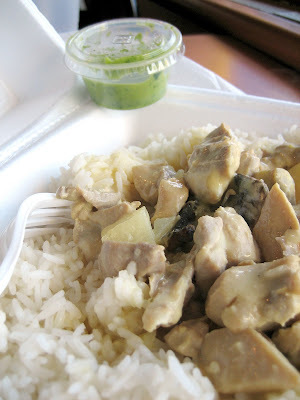 But did you know that there's a Peruvian place inside another food court mere blocks away? That's right. Peruvian. If you've paid attention to Gustavo Arellano and other foodies, you would've known about Lima City*. It's been years since I returned (thanks partly to Franco). The first time around, I wasn't entirely impressed with a dish of saltado I had there -- too soggy. But yesterday, I tried something else called "Chicken with Mushrooms" and it was terrific. Despite the fact that there were other interesting items around it also vying for my attention, I immediately locked onto the dish as it gurgled in a metal chafing dish. The cost was $4.99, which is the standard fee for a 1-item meal served with either rice or noodles. I chose rice and on top of it, the substance was poured. It was a thick gravy as silky as cream, with chunks of butter-soft dark-meat chicken, cubed potatoes, and sliced mushrooms. A tiny container of aji is also included in every order. As I ate, I dunked each forkful of chicken into this spicy, green puree of herbs and chili, taking great care in my portion control so that no morsel goes into my mouth without it. Next time, I'm buying an extra container of that "green sauce" for $0.35. But even eaten alone, the dish was exactly the type that aims for my comfort food sensibilities. It reminded me of an Indonesian dish called "opor ayam" that I grew up with, similar to Thai yellow curry. All of them have something in common: rice doused in a flavorful milky-rich liquid, and braised poultry. But that gravy is key. It unites rice and protein to become a singular entity -- a meal to be scooped in hearty spoonfuls. But in Lima City's case, it also does double duty: since their rice is inordinately dry, the sauce acts to moisten and revive. Those unlucky grains which don't get completely drenched are, in turn, unworthy of consumption. Lima City also offers other traditional Peruvian items. Some are ready-made, but most, like the mountain of fried seafood called "jalea", have to be cooked-to-order. But who are you kidding. The reason you're at a food court in the first place is to stuff your face within the lunch hour you are allotted. At least with Lima City's chicken and mushrooms, you can come back to the drudgery of your cube, full, happy, and on time. *Update (June 30, 2008): A few weeks ago, Lima City changed ownership. This review is for the last incarnation of the place. *Update (July 27, 2008): New signs identified the new occupants as Fountain Valley's own Peruvian Kitchen. Read a review of their lomo saltado here. 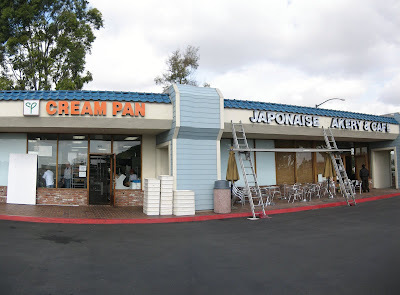 Cream Pan, Tustin's beloved little Japanese bakery, was just that: little. The storefront was nothing more than a door that led to a utilitarian room where they did the baking. Immediately as you enter, there's a tiny counter, a small glass display case, and a few measly square feet of space where you pick, pay, and get out. There's no place to linger, sip coffee, or savor a sandwich. I've spent many a lunch hour eating Cream Pan's pastries outside, in my parked car, trying very hard to keep the crumbs from lodging themselves between the upholstery. And then there's the odd and unpredictable operating hours. They open when they open and close whenever they feel like it. Now, the bakery's all grown up, taking over and expanding into the vacated retail space next door. 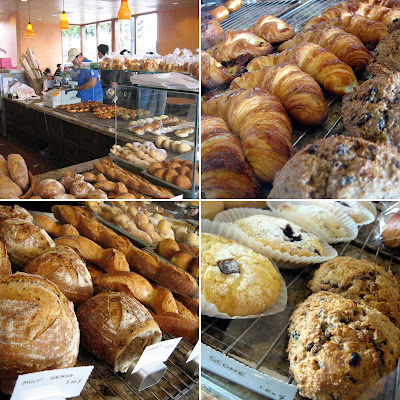 The spacious new digs -- called Japonaise Bakery & Cafe -- is a bonafide hang-out spot and long overdue. 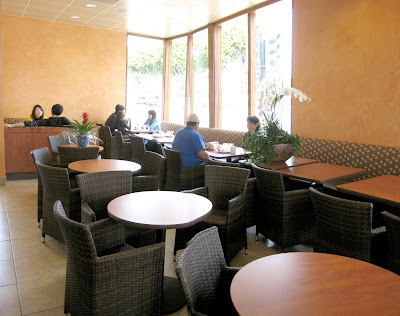 There are chairs to slouch in, tables to rest your arm on, and even a restroom for when you've had too much cappuccino (which they serve in mugs large enough to be soup bowls). The baked goods are just as tempting as they've always been. You can tell just by looking at the sturdy, crusty gashes on the baguettes and rustic loaves that a good slather of butter is all they need. Croissants appear to be flaky enough to cause a minor crumb avalanche when bitten, while the scones seem as dense as Jessica Simpson. But this visit was in service to our sweet tooth. The strawberry croissant was the first one we chose to call dessert. Cream Pan's signature vanilla custard and thick slices of the fruit were sandwiched between crumbly triangles of puffed pastry. Powdered sugar dust clung to it like frost, and then on our fingers. The bulbous dome of the azuki cream was cracked open, like a hatching alien egg. But inside the spongy fried dough, there's some whipped cream and a filling of Japanese red bean. The latter had a coarse texture, similar to tiny, BB-sized kidney beans, but with twice the sweetness. 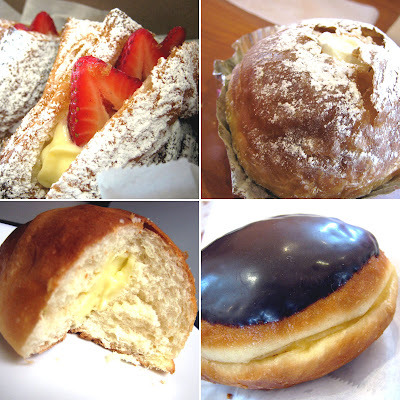 Their Boston donut had more in common to Hawaii than to the Bay State -- the thing tasted more like the malasadas cooked on The Big Island and less like a Dunkin Donut. It's chewy, salty, slightly sweet, and greaseless. Hiding inside its belly was more of that sultry custard. On top, a hard, dark-chocolate shell functioned like a skull cap. But no trip to Cream Pan is complete without a cream pan -- basically a dinner roll akin to the Filipino pan de sal injected with custard. Best part of eating one inside Japonaise: No more crumbs on the car seat.